I had my shade tarp out today for this new project. I am painting another set of garage doors to look like wood. 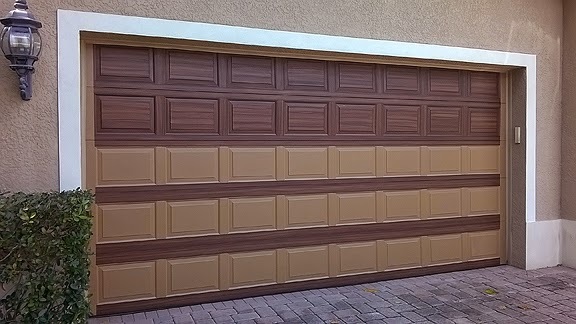 This is one of the bigger garage doors with 5 rows of panels on each door. 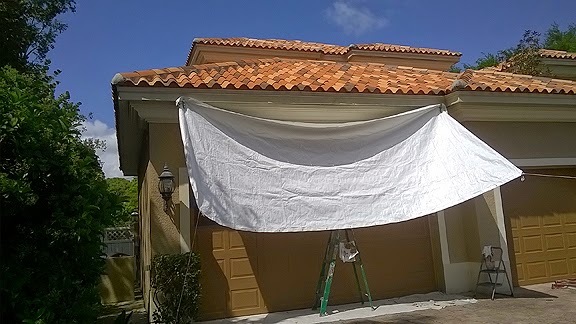 When I have a job that the garage doors on the the south side of the home I always have to use my sun shade tarp. This set of garage doors is in the sun until about 2 pm., then the sun has shifted enough to put then in the shade. I think I really got a lot done today on painting the bigger of the garage doors to look like wood. This was the first day of the actual wood grain painting process and to get the top two rows done and then all of the horizontal spaces was really quite the good day so I am happy about that. At the end of the day the sun has mercifully shifted and the door is in total shade.